This contemporary home design in a suburb of Perth, Australia, was designed by the actor Gary Cooper. Take a look this modern home and feel inspired! The modern kitchen with a black accent wall is broken up by the use of a single wood shelf that’s built into the wall and sits above the fridge. Wood stairs lead to the upper floor of the home. At the top of the stairs, there’s a small sitting area with a blue armchair and a contemporary floor lamp. This place is ideal for relaxing and reading a book. The first living area with a wood shelving and cabinets that run along the wall and lead into the kitchen. A classic living room with a fireplace on one side, and custom cabinetry on the other. The minimalist pendant lamps are eye-catching in this room. Behind the living room is the dining room that’s separated by a sideboard. The dining room sits next to large windows and a sliding door that leads out to the backyard. We really love the mix with contemporary and classic style, in this case, suits perfectly. What do you think? Your home is gracious, everything in your life becomes a little bit happier: that’s the example of this scandinavian design in a modern apartment. But beauty comes in many forms. These apartments, with interiors by Koj Design, are beautiful and sunny. Each has comfortable living areas, cozy, simple bedrooms, and welcoming dining spaces that are perfect for entertaining. These lovely designs comes as no surprise, since our coverage of Koj Design has included lush contemporary bedrooms and clean, modern apartments. Step inside this dream apartment and get inspired. A modern kitchen with inspiring frames and pendant lamps that will turn any setting into the coziest one. So comfortable and stylish! You’ll feel immediately inspired with this colorful rug along with the modern pillows. Take a look the suspension lamp, is absolutely stunning! Blue inspirations in this kitchen floor reminding the sea. The perfect statement for your kitchen. Don’t you agree? Amazing bedroom decor ideas with this stunning modern scandinavian apartment. We believe that you really feel inspired by this scandinavian design! Bring some personality into your home space with a little help of this home style. Scattering pastels throughout your home design is a great way to bring in some color without having it overpower everything else. Here are ways that show you how you can bring pastels into your home decor and make it a little more colorful. To think that marble countertops are outdated is a huge design mistake! This enduring stone is getting new life in home decor and design lovers can’t resist them to embellish their kitchens in refreshing and inspiring ways! White marble countertops are a classic that Beth Webb Interiors cannot put aside, particularly when it comes to boost a kitchen. Are you still not convinced? So, keep scrolling and discover how to create a stunning kitchen that’s all your own. Styled by Brady Design, this elegant kitchen has a statement marble island sprinkled in a classic style room. Muted and monochromatic are the perfect words to describe this stunning neutral kitchen! 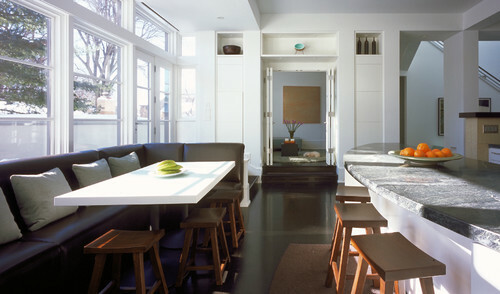 Christopher Architecture and Interiors creates an open-plan kitchen that we keep going back to for inspiration! All-white marble rooms inspire feels of an understated elegance! Designed by MLK Studio, this white marble coordinated with a neutral color palette creates a quite drama unlike any other countertop surface! Here we also have a prime example that marble is such a versatile material! These marble walls are spot on and creates a cold yet refreshing ambiance! 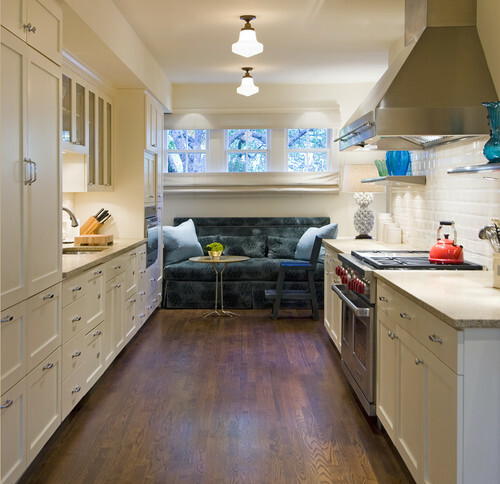 Design by Humans exceeded expectations with this kitchen! Isn’t it inspiring? This bold room has metallic notches that plays off of marble’s splendor. Each element, each detail was designed perfectly! And don’t even get me started on those incredible suspension lights! A close-up on this gorgeous kitchen designed by Charlotte Lucas Interior Design! We have to master this kitchen filled with incredible textures and expressive colors! Brown Davis Interiors created an incredible open-plan room. We love this kitchen for its elegance! One more time we can get over of these suspension lamps too! 2017 has already begun and everyone’s trying to figure out what will be the next big trends for the year. Luckily, today we’re here to talk about the biggest color trends, those of which you are more than encouraged to use in your new modern kitchen! As would be expected, Greenery just had to be at the top of our list. The freshness of Pantone’s color of the year will certainly bring great vibes and a cozy ambiance to your new kitchen. You can pair it up with multiple other colors, either pastel tones like Rose quartz and Serenity, or more vibrant colors like electric blue and bright red! A tone very close to last year’s Serenity, Pastel Blue can look absolutely stunning in your kitchen. Just like in the example above, mix it up with some dark wooden colors and a few neutrals, and see your kitchen design be reborn before your eyes. That’s right! Another great color for your new kitchen is inspired by Pantone’s Bone White tone. A great neutral that can be used with several other brighter colors. It’s an easy road towards achieving a classy and elegant kitchen. If you’re not ready to go full-black, you can start by using Pantone’s very dark shade Anthracite. We personally love it and it can – not so surprisingly – make up for an amazing kitchen design! We just love this shade of green, almost beige, almost brown. It works great as a neutral, as well as a statement color. The secret is all in how you use it. In this case, the result was a very modern space, filled with elegance. What about some inspiration for your lighting design? Yes. Today, we bring you a great selection with some of the best lamps for you to choose. With different colors and shapes, these lamps are splendid for your kitchen. So start now getting a little bit of inspiration and making changes to your cooking space. Take a look at our special selection, you won’t regret! Galliano modern pendant: An expressive design inspired in jazz music, Galliano suspension ﬁxture has a sculptural shape and it’s versatile and yet contemporary. An extremely balanced design which gets even more beautiful when you see light being casted thought its pipes. Up to 5 tubes, it produces a unique and gorgeous lighting effect. Let’s find out how to get a mid century modern home with our home design ideas for today! The mid century modern look really is everywhere these days. You ask why and we shortly answer: Mad Men’s Series. You may find the interior design of the 50′ a little bit ingenuous, but the truth is that this style is back and we think it’s back to stay. A wooden sideboard can be the best way to do this! If there’s a piece of furniture that has a totaly mid centiry style, sideboards are that pieces. Golden mirrors are essential pieces if what you want is a midcentury-modern home. This is the easiest way to go elegant. Get your own modern kitchen. Contemporary chairs, a round table, a hanging lamp and strong colors: those are the secrets. There’s nothing shy about midcentury modern patterns. Bold geometrics, strong, sensuous curves and whimsical motifs give rooms a strong graphic punch. Use it in your wallcoverings. What do you think about this home design ideas? This is the way to go mid-centiry modern. Are you in? Don’t forget to explore our pinterest boards for more Home Design ideas and inspirations, as well as our twitter. Get more ideas for your interior design projects and find functional, stylish, sizable and trendy decor choices. If you want to find more about the articles in the images, click on the photos.